This word has been on my heart for quite some time, and I felt specifically like the Lord wanted me to release it to you today. The specifics in this word won’t be for everybody, although the principles in this word are for everybody. But if the specifics of this word are for you, you’ll recognize yourself described below. 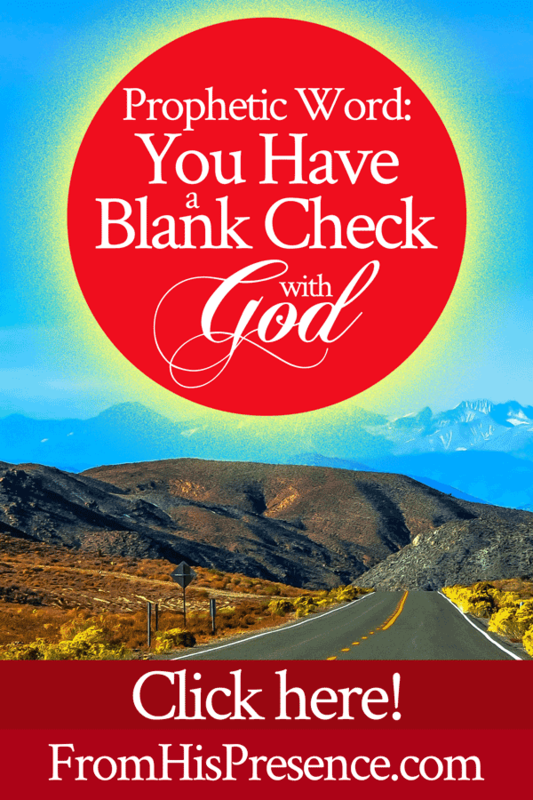 You have a blank check with God. You have sought God with all your heart for many years. You have loved Him and you still do. Along the way, you have done everything possible to bring every aspect of your life into full obedience to Jesus. You have been purged, and the Lord has refined you in His fire. You have been through hell and back three times. (I heard the Lord say that very specifically: “three times.”) This triple refining has removed the dross from your life in greater ways than you know or imagine. The Lord says to you, “I am pleased with you. I love the way you love Me. I love the way you serve Me. I TRUST YOU. I trust you to obey My Word, follow My instructions, pull back if you get ahead, keep pace with Me, and venture out where and when I send you. So now I want you to know that you have a blank check with Me. My Word is true, and I told you over and over in My Word that you have a blank check with Me when you are obedient. I have refined you as silver; yes, as gold. I have searched you and found nothing amiss. You have been weighed in the balances and found NOT WANTING. Now, beloved, I want to know what burdens you. The dreams in your heart are there because I placed them there; but I desire not to work alone, but to co-labor with you. I am moved by what moves you. I will be burdened for what burdens you, for you are My hands and feet on the earth. So I want you to tell Me: What do you want to do? What would you like to accomplish next for the taking of My Kingdom? Where would you like to go? What would you like to do? Surely I know your heart already, but I desire for you to tell Me anyway. I want to converse with you; to talk with you; to plan and dream with you. We are friends, you and I; and I love to see what matters to you. You have a blank check with Me. I say it again: ‘You have a blank check with Me.’ If you get ahead of Me, I will tell you; I will make it plain. If you are in step with Me, and I with you, you will know that too. There are no secrets between you and Me; I am keeping nothing from you. You are My friend, and there is open communication between us. So let’s move. Let’s go. Let’s co-labor on the earth. Wow! Thank You, Papa! Beloved, you have a blank check with God. Does this word resonate with you today? Does Holy Spirit bear witness in your spirit that this word is for you? If so, please leave a comment below! 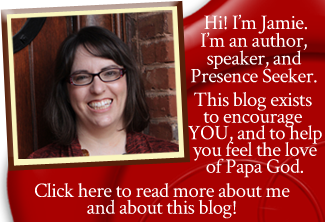 I would love to hear what Papa is saying to you! Yes Jamie, this is for me! I messaged you on FB a few days ago about your word for this year and how much it has meant to me. Your word today says a lot of the things God has been speaking to me. My problem is, there’s not one thing I want to do. There are several things! Actually, there is one thing that stands out. I have always wanted to write books, but have never been able to clear the negative chatter in my head enough to get my thoughts organized. I’m also very afraid of letting others read my writing. I’m starting your rejection mini-course today, because God revealed to me that rejection is the source of that problem and a slew of others. Wow, thanks! Amen I write this cheque with gratitude ?? Thank You Father God that I can do your will,my entire family in Jesus name Amen ?? Then the scripture reference nearly flew off the page at me, then I heard the Lord say it again. However, I need prayer because my family is very controling and i will face much opposition, but i will obey God. I needed this word so bad. My heart is to do Gods will for me. I am a prophetic intersessor and satan tries to kill me, distract me sending men to me, and all i plan to do is follow Jesus. You have an encouraging ministry and I thank God for you. I do need to be aligned with a ptophetic ministry. I also have a deep desire to write. Father said i would write articles. God confirmed His word to me three times about completely selling all i have anf to give yo thr poor and follow Him. He kept highlighting 3’s to me. Now i know why. But. Beyond that i know nothing. God bless you my friend. You blessed me with this word today I have been walking this very specific walk and this was the first email start to my Bible study this morning. I want to encourage you that you are hearing God and blessing all your heavenly family Jamie. You have blessed me in ways words can’t describe. Glory and God bless you and your ministry. I long much for this. A BLANK CHECK!!! I am in a fire right now and I feel direction-less. Lord, please help me. He is speaking to me! Not only a blank check but a blank canvas. We were talking about that this morning. He’s the painter, I’m His masterpiece. He says He will teach me how to paint, I can hold the brush with Him. He’s not worried I will mess up His painting. He has endless colors and endless brushstrokes. Now with a blank check and a blank canvas, we are unstoppable. Thank you, Jodie, for putting a sharp point on Jamie’s pencil. There is something I have back-burnered for too long. I appreciate the encouragement. Yes, thank you Lord. All of your words speak to me but this one is most important. In three weeks I will be part of an accelerator group for a new business. I had a plan for the business and I’m not sure if it’s the correct one. I’m asking Jesus to direct me so that He makes it into something for his kingdom so that I can use it to help those in need, some family members. Not sure how. We’ve been struggling financially and had no money for rent. A check then shows up for the exact amount needed. This happens to me a lot so I know the money needed always comes even though I don’t know from where. I’ve been to hell and back literally once that I’m aware of but I think something may have happened when I was little also that I can’t remember. Anyway I’m hoping this is God telling me that this business venture will be His and He will direct it for His purpose. The blank check so that I could have the funds to start it up since I would have to leave my job to do that. Thank you Jamie for a word so beautiful. This really spoke to my heart ? Thank you so much for all of the encouraging words you have blessed me with. I to believe and receive this on time prophetic word from the Lord through you! I love you and please continue your awesome work for the Lord! Yah has spoken to me as well after praise and worship and prayer. He told me what to get ready for(and how to get ready) for what He has for me to do! This word is true! I have not wanted for anything! Even when I don’t have what I need in my finances to give, like right now! I have prayed and I know that he hears me and he delivers! He gives all that I need for that time. I come onto an agreement with the ladies’ comments above mine! I have experienced so much peace lately because of acknowleding him, by spending a lot of quiet time with him in prayer! Thank you for this word! The same goes for you too! Be continuously Blessed by all you do from Yah! Ahmein!!! Your ministry has spoken to me and helped me a lot, especially over the past 6 months. WOW..But his word….oh my this word… the Holy Spirt bears GREAT witness in my spirt over this word especially the specifics. An area in my life has take me to hell and back 3 times…yes indeed. I feel The 3rd refining has been taken place over the past year – 2018. And on 1/29/2019( Tuesday) I was officially and leagally released from hell!! ( toxic and very physiologically abusive marriage) What is also interesting is that I felt instructed to cast 3 stones into the river after the mediation. Specifically 3. To represent and release the rocks that took root in my heart from all the offense, anger and pain. So you bet I did!!!! I do not always get to read all my emails the day of but when I saw your email today with this word, I knew in my spirit I needed to read it today. Also, I can be an overthinker regarding putting my thoughts into words( lol) which has always kept me from commenting on your blogs or any blog. However, my mind could not over rule my spirit on this one 🙂 I am beyond blessed and thankful to have found your ministry. You are a mighty and powerful vessel for the Lord and a beloved Daughter. I pray for Father God to shower you and your ministry with more and more blessing, peace and joy! Thank you so much!!! This so confirmed things going on in my heart. Been hearing them in NY Spirit but really don’t know where and how to start. To pen those words down “the books” He has placed in my hands to write. To step out into the field. But Jamie so many hinderances, burdens, suppression she and oppositions. But thanks be to our Father, who cares immensely for us. This is sure for me. Yes, this word is for me. Thank you. Hi I was searching for an answer, guidance and direction and this was the first email I opened. Can you please explain to me what a blank check is? I need to be 100% sure. I am a little confused. I am filled with dreams and at a very difficult crossroad. Alot of confusion. Hey Nadia, a “blank check” means you can tell God what you want to do, and work with Him to see it happen. Yes. Hell and back three times was my husband leaving me and divorce, a work injury to my brain which I have struggled with healing with for 7 years, and bankruptcy. I’m ready for my blank check as I have remained faithful to Him despite fearful temptations to abandon all hope. Yes thats for me.I have been in and out of personal business three times and then get employment but while in employment those three times it has been hell.lately i have been asking God to reveal to me that which He want me to do as a business even if its that humblest business am ready to do it.Thank you Abba Father for the blank check. Jamie, I feel like your words are the confirmation that I have been seeking for a while now. Thank you so much for sharing. Praise be to God! I receive it in the holy name of Jesus! May God bless you and your ministry! What would you like to accomplish next for the taking of My Kingdom? Holy Spirit reveal to me what’s in my heart. Reveal to me what you put there. Thank you Daddy. God bless you Jamie. A Word in time for me. Awe thank you for the confirmation. This was for me. ? God is so gracious. How beautiful!! How exciting! This is going to be so good. Thank you so much for the encouragement Today! That word was for me! I have been praying about several things going on in my life and I am receiving answers to my many prayers. Thank You Abba, I love you and I thank you so much for loving me. Thank you Jamie! May God Continue to Bless You and Use You In This Oh, So Important work! We Serve Such an Awesome God! Amen I am very emotional right now I have known always that God is always with me through it all I still call his name he is Jehovah elshadai Jehovah adonai Jehovah rapha Jehovah nessi alpha and omega my strong tower AMEN AMEN AMEN AMEN AMEN thanks you. Thank you Lord, my God! I Love You with all my heart! I believe God was talking to me, I would like for God to give me his blessings as I’m about to venture into new business. This really touched me. Amen. I am sure this is for me. Today I was totally upset and was eating for that. Thank God. I love God. Hello Jamie, hope you and your family are doing great! I took some time to write this testimony because i wanted to see for myself if this was for real rather than trust all you told me during the retreat…i had my doubts, sounded all too good to be true…its been almost 5 months now and all i can say is that since i accepted Jesus as my Lord and Savior my life has not been the same….he has been showing me miracles daily, he has also given me a incomprehensible peace and joy, and has been showing up for me in unimaginable ways….i am beyond, truly beyond grateful and thankful to him and to you for being an authentic vessel of God and for enabling this to happen for me….THANK YOU…may God always bless you and your family…lots of love from your sister in Christ in Haiti…kisses to the whole team for me, i think of you all, alll the time…angels! I am happy to say that Jesus is my Lord and Savior!!!!!!! Thank you God for all my wonderful family and friends and this person who helps by sending me beautiful words of encouragement and for all the wonderful blessings every single day. Thank you lord I am not where I was before today. Lord I am here for you just as you are here for me. Guide me according to where you need me I am yours heavenly Father forever and ever. Thank you, Jamie for this word. It definitely spoke to me and the questions I’ve had. I’m so grateful that God has said yes to allow me to work in a new career that also aligns with my passion but would also bring Him Glory. I pray that God continues to orders my steps and thank Him a million for his love, his care, his blessings! This word is for me, hey Jamie I love and appreciate you and everything you are doing for the kingdom of GOD? Every word resonates our Lord’s love to me. I’m humbled to know how great God’s love is to me! It’s my joy to do His will and work for His Kingdom! May our ABBA Father bless you abundantly for being His worthy instrument to me and sharing what He put into your heart for many like me! Loads of love and blessings! OH My Lord Jesus, wow this word just blew my mind! I’ve been through hell and back 3 times and each time took years of suffering big time! And Father God has been blessing me in the strangest ways, buts that’s how I know it’s Him, all the miracles this past few weeks, I just moved in to a beautiful apartment for just me and my 8 year old son, hard wood floors everywhere, double parlors, 3 bedrooms, closet space, and landlord didn’t ask for credit check nor did he ask for security deposit, but I just had to come up with the appliances washer n dryer too, well this lady I bumped into she had a maytag commercial dryer for sale, 1 year old with warranty papers and all, I told her I didn’t have the cash for a nice super dryer like that, and she said she’d trade with me, what did we trade for the dryer, a vintage room dividers, a real not plastic mannequin for me selling clothes online, and a Lil white vintage bureau that she would want to make over, well long story short Jesus made all this happen! Then I needed pots and pans, don’t you know it in a brand new huge oversized bag outside my new place was in the big bag the best shinny sparkling awesome pots n pans plus more, serving spoons, pizza cutter, etc. Of course I laughed and looked to the sky and thanked Him All day boy He can make me giggle! And the little stuff like a shower curtain rod I needed as I told my mom I needed one, as I’m coming out of the elevator with my son from my mom’s place, there leaning on the wall a shower curtain rod, and those little things mean a lot, only Jesus would know though, as I’m telling mom all these miracles, my mom confirms another part of His word that you told tonight as I read, mom says well Jesus IS your friend, well when she said that to me, that’s what hit home hard,!!! I cried when she said it, and tears came when I read your words from my friend Jesus! Wow and I feel it in my bones and my whole being that this is only the beginning! And that’s only mentioning just a few miracles, thank you Jamie for your obedience to our Father of lights so we can get our on time word! Thank you very much for the word of encouragement ,yes I have a blank check with God, I Know he is going to do miraclous things for me and am very much ready to do his will.Jehovah God is your name,you are who you are,your kingdom realms forever.Amen. Tears are just flowing while reading this Word from Papa. This is the THIRD time I received it…THANK YOU HOLY SPIRIT..
May God’s peace be with you and all of our Presence seekers family. Been refined in the furnace of affliction…Been thru hellion situations. I thank God for His mercy.A blank cheque I what I need now more than ever. I thank you so very much for the beautiful word I received it was truly a word for me. I have been through Hell Jamie The message you gave to me from the Holy Spirit was 100 + 10% accurate. I cried when I read how much God loves me I always say that and I’m always telling him how much I love him how much I love Jesus and I thank God for the Holy Spirit I am also gifted but I know there’s so much more God wants me to know so we will do it together I will support you Jamie and your ministry the best that I can you are truly the daughter of the high most God. I truly believe that Papa God has heard my prayers . My heart cries on daily basis for the orphans , widows and the aged , the disabled and the strangers . Holy Spirit has even shown me the plan of a home that I have to build for them so I truly believe that is where I want to go with Papa God . I thank Him for offering me a blank cheese . God bless you Jamie for the encouragement . Thank you Lord… Now, Its in your mighty hand… I’ve been with my blank check in and out of hell for three times in three years. Im about to lost hope but then tonight through Jamie I recieved your messages. Let it be spend for the glory of You. God bless you more and more Jamie.